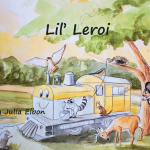 DURBIN, W.Va. — Representatives from the Durbin & Greenbrier Valley Railroad will gather with West Virginia children’s book author Julia Elbon, local leaders, and families in Durbin on Saturday, June 23rdto celebrate Elbon’s railroad-themed children’s book series: Lil’ Leroi. The celebration coincides with the 1936-built diesel locomotive’s birthday. Elbon, a West Virginia native and author, has written a three-part series about Lil Leroi’s adventures as a locomotive on our tourist rail lines in mountainous West Virginia. The setting of this story is a real location. The Durbin Rocket, its tracks, and the trains of the Durbin & Greenbrier Valley Railroad do exist as presented in Pocahontas County, West Virginia. The pristine, quaint environment inspired the fictional characters and helped to make the color of the tale. “These stories recognize the switchback tracks on the high Cheat Mountains. Powerful steam and Shay steam engines were built to switch back and forth on the mountain tracks as they climbed to the mountain top. This track system conquered the heights by gaining elevation on each switch back and forth and solved the transport problem. People conquer obstacles in their lives and move on in the same way,” Elbon explains. “The stories recognize that behavior changes and it can switch back and forth like the track system. The stories show recognition and understanding of the emotions, which arise in our lives. The emotions of anger, love, and fear are shown in feelings, actions and behaviors. These emotions, when understood, communicated and controlled, can turn productive and enable fulfilling lives,” Elbon’s website describes. We hope you can join us for a meet-and-greet with Elbon and photos with our very own Lil’ Leroi during this special event taking place on Saturday, June 23rdat 1:00 p.m. in Durbin, W.Va. This event is OPEN to the public and everyone is invited to attend. For general inquiries, contact Chase Gunnoe at 304.636.9477 Ext. 117. To visit a website dedicated to Lil’ Leroi, click here.